SILVA (www.arb-silva.de) represents the world's leading public database for ribosomal RNA (rRNA) gene sequences and provides comprehensive, quality checked, and regularly updated data sets of aligned small (16S/18S, SSU) and large subunit (23S/28S, LSU) sequences for all three domains of life (Bacteria, Archaea, and Eukarya). The service also includes an integrated and constantly maintained microbial taxonomy, representing the current reference in environmental microbiology. The SILVA project is headed by the Microbial Genomics and Bioinformatics Research Group at the Max Planck Institute for Marine Microbiology and Jacobs University in Bremen, Germany. Ribocon as a partner is actively involved in the project by supporting the maintenance and advancement of the SILVA databases and services. In addition, Ribocon officially issues the SILVA Commercial Licenses (see below for overview on SILVA general terms). The SILVA web portal offers different entry points to access the integrated database content. Browse and comprehensive search functions allow to view sequence metadata and quality information, and to obtain further information from linked external resources. Selected database entries can be collected within a cart system and downloaded in various formats for further local use. Also the complete database content as well as the SILVA taxonomy can be retrieved in different formats. The SILVA database is organized in different layers of increasing sequence quality (Parc, Ref/Ref NR) and selected layers are also offered as database files for direct local access and usage by the ARB software package. All sequences offered by SILVA are aligned according to the high-quality ARB/SILVA global alignment which is maintained since more than 30 years. Besides the database access and data retrieval options, SILVA offers a number of online data processing and analysis functions such as sequence alignment and classification, probe and primer evaluation, as well as an online amplicon data set (NGS) analysis service (SILVAngs). The SILVA portfolio is completed by different complementary projects such as the unification of the Eukaryotic microbial taxonomy and the Living Tree Project (LTP), providing a pure type strain data set. (1) SILVA is free for academic/non-commercial users. These are represented by universities and non-commercial research institutes such as members of the German Helmholtz Association, Leibniz Association, and Max-Planck Society, as well as US National Labs. (2) If you represent a COMMERCIAL/NON-ACADEMIC USER, you need to purchase a license in the moment you want to exploit any SILVA downloads (data sets, subsets thereof, and/or analysis results). Without such a license, only limited/temporary use of SILVA data downloads for test purposes is allowed. All downloaded files need to be deleted latest after 10 days and commercial exploitation of your results/outcome is not permitted. For browsing/using the SILVA webpage to obtain any information provided (without downloading any data), there are no restrictions also for non-academic users (no commercial license required). Standard support (as for academic users) is included, please contact silva@ribocon.com in case of any such request, using the subject start '[standard support]' followed by a brief own identifier (your subject). The only service provided by SILVA solely on registration is SILVAngs (a web-based data analysis pipeline for rRNA gene amplicon reads from high-throughput sequencing). In brief, also SILVAngs is free for academic/non-commercial users but based on a credit system to assure balanced user load (no unlimited access, extended resources on request). Also commercial/non-academic users can register for the SILVAngs services but with limited credit charge for test purposes only. In case of further interest (productive data analysis), a supervised data analysis service based on the SILVAngs pipeline (same outcome) is provided by Ribocon for commercial users. For more information, please see our section on Microbial Community Profiling. In case you are interested in extended SILVA-related support or services (beyond a standard support request as outlined above), Ribocon offers additional professional support for both academic and non-academic users on request. 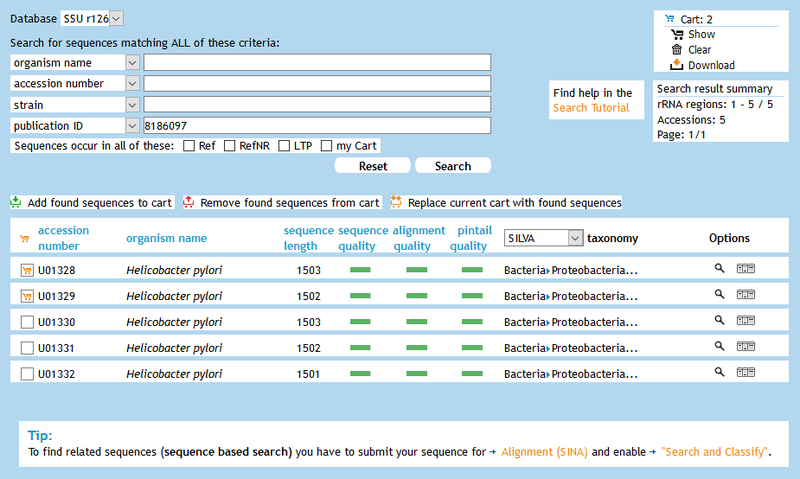 Examples range from customized database exports (compare the SILVA Download Archive for already existing exports) to consulting on your specific workflow, as well as data analysis services including sequence classification/identification, phylogenetic reconstruction, and probe/primer evaluation (see also our Training portfolio). Just contact us at silva@ribocon.com for any enquiries on extended professional SILVA support. Change of SILVA license model for commercial users in fall 2018! The term Parc represents the complete SILVA SSU/LSU database content. Ref and Ref NR represent improved subsets for which also corresponding ARB downloads are provided (with a guide tree only included for Ref NR).